With temperatures suddenly dropping from warm to cold, making us bundle up when we were just outside in single layers, having a fall season is a long lost dream. Winter is basically here, official or not. Now that it’s the start of November, both people and businesses alike are already prepping for the holidays and the rest of winter. One good thing about it being cold out again is that it signifies the start of the ice skating season. 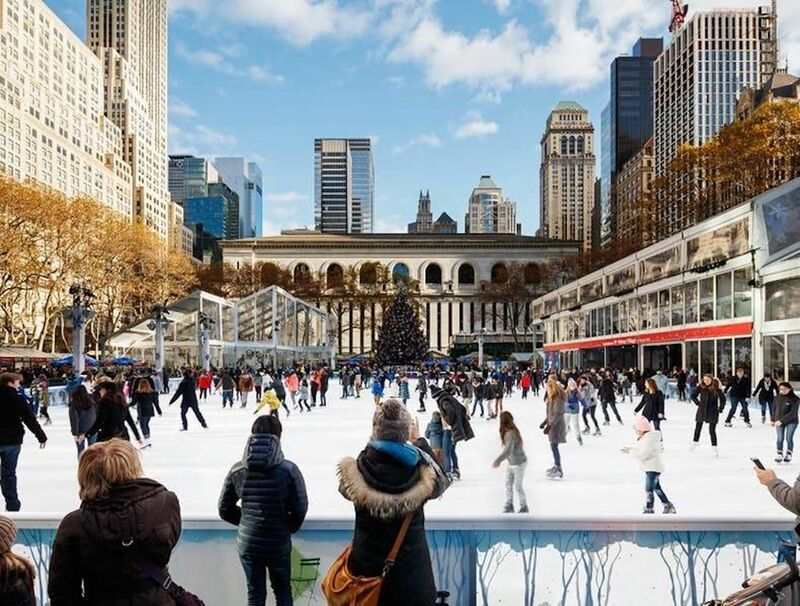 The Rink in Rockefeller Center and Wollman Rink in Central Park are the two rinks that most people have heard of in New York City. But both are in the middle of people-heavy areas, especially during the winter, and the lines can get unbearably long. Avoid the stress and visit one of these five ice rinks alternatives. Bryant Park is a fun place to visit and relax in its own right year round, but there’s something about it during the wintertime that’s utterly magical. Usually open around the end of October until early January is the Bank of America Winter Village, which really brings the small space to life. A holiday market full of shops, food stands, and more is packed inside the park and along its perimeter, along with Santa’s Corner, where people can take a photo with the big man himself. At its center is the outdoor ice skating rink. Weather permitting, it’s open daily from 8:00 AM to 10:00 PM. Admission is free, but if you don’t have your own skates, it’ll be $20 per pair. There’s an express rental that costs an extra $10 so you can skip the lines, as well as helmet rentals, socks for purchase, bag check, lockers, and a skate sharpening service. If you’re a beginner or just want to brush up on the basics, there’s a skate school that offers lessons on certain days at the rink for a fee. Be sure to visit at night, though, when all the lights shine bright and with a purple-esque glow. Corona Park is gigantic, with so much park space that it seems never-ending. There’s the Mets’ Citi Field Stadium to one side of it; the Billie Jean King National Tennis Center to the other; the Queens Museum, Queens Zoo, and New York Hall of Science to another; and the Queens Botanical Garden down the road from them all. Rounding out the eclectic mix is the World Ice Arena, an indoor skating rink with all the charm and size of other ice rinks in NYC — but without the crowds. If you’re worried about making a fool of yourself by falling and eating ice, this is the place you should go skating in peace without fear of embarrassment. No one will pay any mind, but if you do need help, there will always be someone ready, willing, and able. 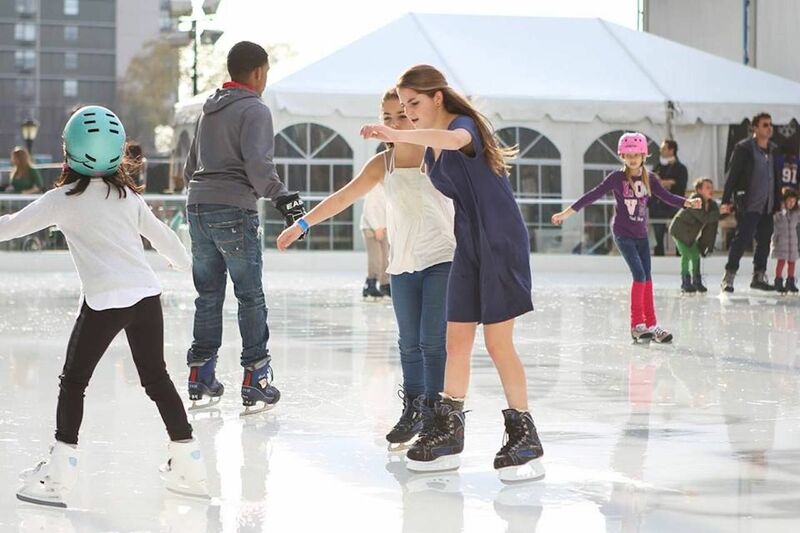 Skating is open-year round with an admission price of $7 for all ages on weekdays and $10 on weekends (this pricing starts at 7:00 pm on Fridays). Skate rentals cost $6. Located right on the water in Battery Park is Brookfield Place, a shopping and office-building complex. Various companies find their homes in the offices while a luxury mall and huge pavilion (both indoors and out) take center stage. From the riverside, you’ll get views of all the tall buildings in Jersey City, and when the sun sets, the colors reflecting off both the buildings and the water beneath them make for an idyllic sight. You’ll even get a nice view of the Statue of Liberty and Ellis Island. Come winter, Brookfield opens up a small ice skating rink right outside, called the Rink. This year it’s estimated to open sometime in November, and it’ll go until the cold weather ends. Skating here is divided up into 90-minute sessions throughout the day and will cost $15 for admission and $5 for skate rentals. It’s important to remember that you’ll only be able to skate during the specific session you booked. While you won’t have unlimited time on the ice, the rink does also host special guests and events from time to time — this December, Olympians Melissa Gregory, Denis Petukhov, Kaetlyn Osmond, and Jeremy Abbott will be visiting for a “skate with the stars” event, as well as joining in on a night of performances, music, and dancing. The uptown area of Manhattan is garnering more and more tourist attention, and rightfully so. It’s got Riverside Park running straight up on the west side of the city, Harlem, and Highbridge, among a plethora of other things to see and do. Right on the water in Hamilton Heights is Riverbank State Park, which has direct, unobscured views of New Jersey across the Hudson and the George Washington Bridge. The park is a nice way to spend an afternoon no matter what season you visit, but winter is when you’ll want to go for the ice skating. The rink is outdoors but has an overhead roof to protect skaters from any snow or rain. The season runs from early November until mid-March. With $5 admission for adults, $3 for kids, and $6 skate rentals, it’s one of the more affordable options you’ll get in the five boroughs. Chelsea Piers is a sports and entertainment complex that, if you grew up here, you either loved or hated as a kid. You didn’t like it if you went too often, but if you only went once in a blue moon, then even the prospect of going was exciting. Every sport imaginable is offered here, from swimming to dance to rock climbing. In addition to sports is the indoor ice skating rink, so you can skate without feeling the outside weather. Sky Rink is a huge rink that could fit an entire hockey team (or several) and its fans. It also offers up some pretty sweet views of the Hudson, so whether you’re hugging the handrail or doing figure eights, you’ll have a reward to make it worth it. The entry price is $12 for all ages, $6 for skate rentals, and $5 for helmets.